196 Jul 29/13 Yesterday we took a road trip to NE Alberta, and it's a long story, but we ended up having coffee with an elderly couple at their home. When we were leaving I noticed these beautiful white flowers in her flower bed and asked her what they were. She said she didn't have a clue, but would I like some. She gave me two big clumps that are now planted in one of my gardens. Does anyone have any idea what they might be. The plants are about 24" high and the flowers grow on a single stem, similar to to daisy. 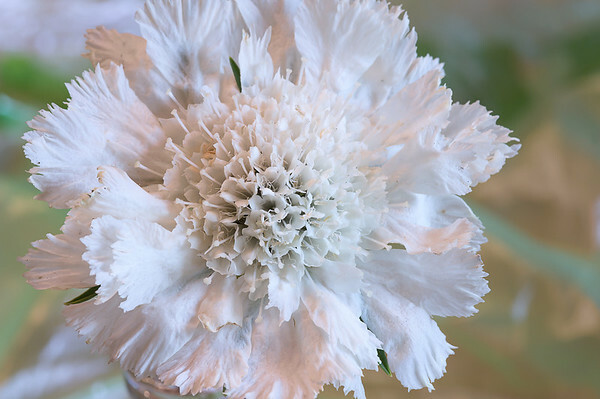 Identified by a gardening friend "White Pincushion Flower" or Scabiosa caucasica "Perfecta Alba"
They are stunning. Look like they might be of the carnation family, but pincushion flower is a cute name . Beautiful shot and lovely flower! Sounds like a special day. Lovely shot of this reminder for you of a happy instance of serendipity. I was going to say "scabiosa." Looks like someone beat me to it. Beautiful shot! Whatever it is, I love it! Excellent capture! Beautiful soft color, excellent detail!